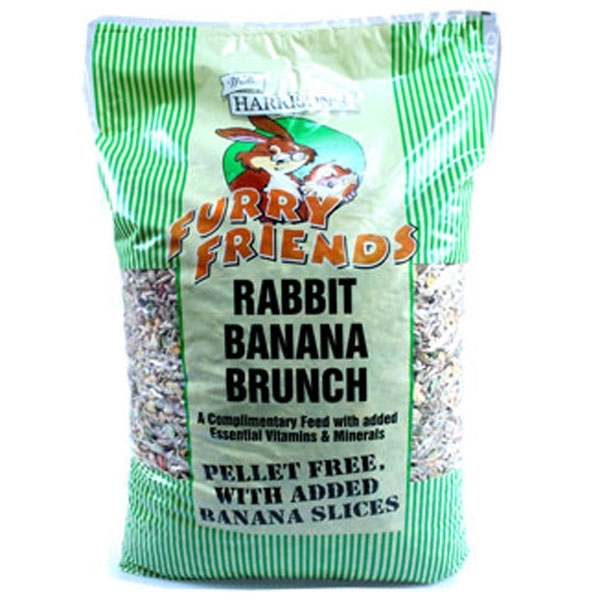 The Furry Friends Banana Rabbit Brunch is a complimentary rabbit feed with added essential vitamins and minerals. It is pellet free and contains yummy banana slices. Cooked Flaked Peas, Cooked Flaked Barley, Oats, Cooked Flaked Maize, Cooked Flaked Beans, Mixed Wheat Discs (with vitamins), Banana Chips, Flaked Carrot, Banana Essent, Vitamins & Minerals. The introduction of a new diet should be gradual, preferably over a period of ten days. As a guide, an average adult rabbit will require 100-150g per day of Walter Harrison's Rabbit Banana Brunch. Roughage (such as frequently changed clean hay), and water should always be available as well as fresh greens. Feed more in colder weather, less in warmer if your rabbit is kept outside. it is important that your rabbit does not become overweight, weigh regularly and achieve a constant adult weight by adjusting the diet. There are currently no questions for Walter Harrison's Furry Friends Banana Rabbit Brunch Food - be the first to ask one!